If public opinion aligns with the 28 voters who submitted a ballot for this week's edition of the 2019 Kentucky Derby Media Poll, well, meet your favorite. 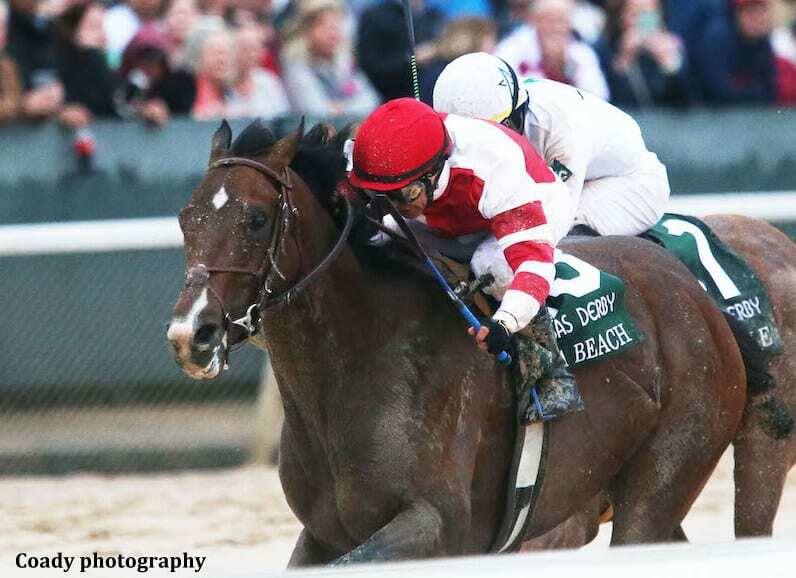 Arkansas Derby (G1) winner Omaha Beach collected 15 first-place votes and shot to No. 1 in the rankings assembled each Monday by HorseRacingNation.com, surpassing Roadster, the Santa Anita Derby (G1) winner who held the top spot last week. “The cream finally has risen to the top,” said Steve Haskin, author of BloodHorse's Derby Dozen. That'll depend on who rides them, too. Whomever ends up the favorite will have history on his side. Since Churchill Downs instituted the points qualifying system for the Kentucky Derby's 2013 running, the top post time betting choice has won every edition. Japan's Master Fencer, who has accepted an invitation to run in the Derby, received votes but didn't garner enough support to enter the rankings. Meanwhile, Anothertwistafate, beaten favorite in Keeneland's Lexington Stakes (G3), is hanging on to 19th as the highest-rated horse in need of defections to enter the prospective Derby field. This entry was posted in Triple Crown and tagged game winner, improbable, kentucky derby, Kentucky Derby Media Poll, omaha beach, roadster, tacitus by Press Release. Bookmark the permalink.